Garry O’Connor’s goal three minutes into injury time ended Hibs Highland hoodoo as the Easter Road outfit clinched their first ever victory in Inverness. On nine previous occasions the Edinburgh club had headed back down the A9 without a victory, but O’Connor’s first goal since returning to the club ended a miserable six-year run. Although Caley were made to rue a string of missed chances, Hibs keeper Graham Stack’s first real save came in the dying minutes as he beat away a tremendous effort from Shane Sutherland. 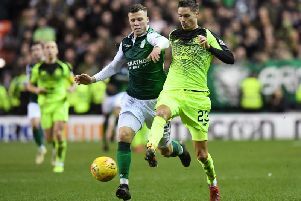 Both sides had begun the campaign with a defeat, and this second loss of the season meant the home side were the only team still to secure a point in the Scottish Premier League. Two of Caley’s three most recent signings, Wales midfielder Owain Tudur Jones and Austria Under-21 full-back Thomas Piermayr, had come into the starting line-up in place of Andrew Shinnie and David Proctor, while ex-Hibs skipper Chris Hogg who joined the club 24 hours earlier was missing from the squad. David Stephens replaced the injured Sean O’Hanlon in the visiting defence. Piermayr’s 25-yard drive flew just wide of a Hibs post and the visitors responded immediately, with Kenny Gillet’s last-ditch tackle halting Ivan Sproule in his tracks with the Northern Irishman set to score. With Hogg not yet match fit, his former team were finding their way through the centre of the home defence. Ryan Esson beat away a 20-yard drive from O’Connor and the Scotland striker was denied again when his side-foot effort from just three yards following a Sproule cross struck the goalkeeper on the face. Butcher was berating his players in frustration and they responded with a half-volley sent over the crossbar at the back post by Richie Foran. As Caley showed signs of improvement, Gregory Tade had the ball in the net, smashing the ball home from close range, but his celebrations were cut short by an offside flag against Foran. Inverness continued to improve after the break, but the officials came to their rescue after Ian Murray smashed the ball into the net from six yards only for the goal to be chopped off thanks to a flag from the assistant referee. Hibs took heart and Esson did superbly to turn a Matt Thornhill scissor kick over the crossbar. Tansey poked the ball just wide from close range after a good run by the Inverness midfielder, while Tom Aldred failed to connect from only two yards as a cross flashed across the face of the Hibs goal. Hibs keeper Stack parried clear a powerful effort from Sutherland, while Tansey struck the post from close range, but the visitors stole the points in stoppage time when O’Connor’s scuffed effort snuck past Esson.